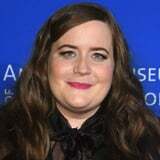 Aidy Bryant is taking the lead in a new comedy series officially set to premiere on Hulu. The streaming service ordered six episodes of Shrill, a show based on the memoir of blogger Lindy West (Shrill: Notes From a Loud Woman) that is described as "the story of a fat young woman who wants to change her life - but not her body." The series's production team already boasts a number of well-known names in comedy, including Elizabeth Banks, Parks and Recreation's Alexandra Rushfield, and Saturday Night Live's Lorne Michaels. Bryant and West are joining together to adapt the book and cowrite the story for the pilot. Banks and Michaels will serve as executive producers, with Rushfield also pulling double duty as cowriter and showrunner. GLOW director Jesse Peretz will helm the pilot episode, with Portlandia's Carrie Brownstein tapped to direct the second. The series follows Bryant as Annie, a journalist juggling bad boyfriends, sick parents, and a perfectionist boss while the world around her sees her as not good enough because of her weight. When she starts to realize that she's as good as anyone else, she acts on it. Rounding out the cast are Lolly Adefope as Annie's best friend and roommate, Fran; Luka Jones as Annie's boyfriend, Ryan; Ian Owens as Annie's friend and coworker Amadi; and John Cameron Mitchell as Gabe, Annie's boss. The series has the potential to bring a refreshing perspective to the TV landscape, and with so many funny people working behind the scenes, we can't wait to see what it comes up with! Production for Shrill begins in August in Portland, OR.